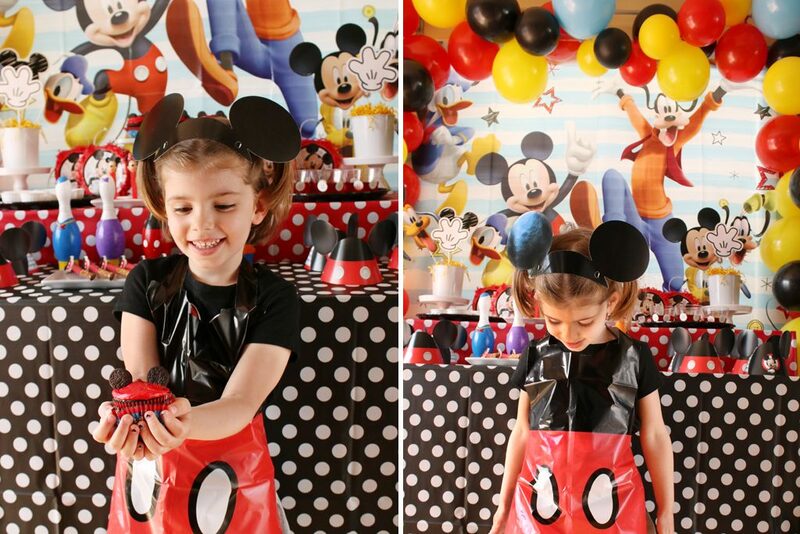 🎵🎵🎵 “What’s the coolest party theme when you’re turning three? Hot dog! 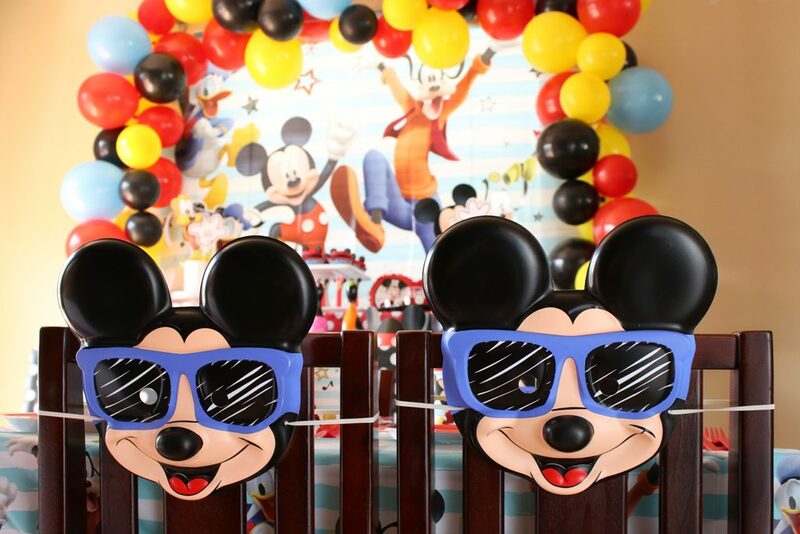 That’s right Mickey Mouse and the Disney gang are here to wish your little one a happy 3rd birthday and we’re all cheers! Wow with a statement backdrop that is easier to create than you think! 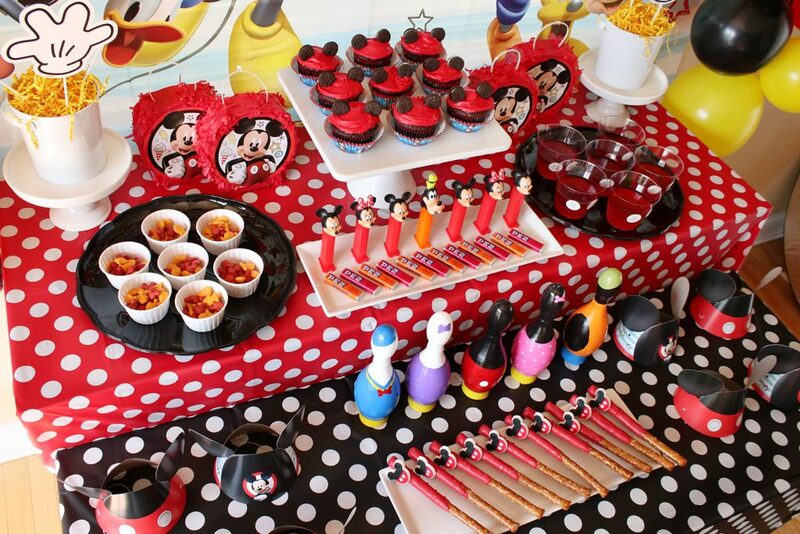 Indulge in an assortment of delicious party treats full of Mickey’s ears! Excite with a party favor that brings the party fun home. This post was written, styled and shot by Tara at Spot of Tea Designs. She keeps her ears tuned to all kinds of smart tips and tricks that she shares on her blog. 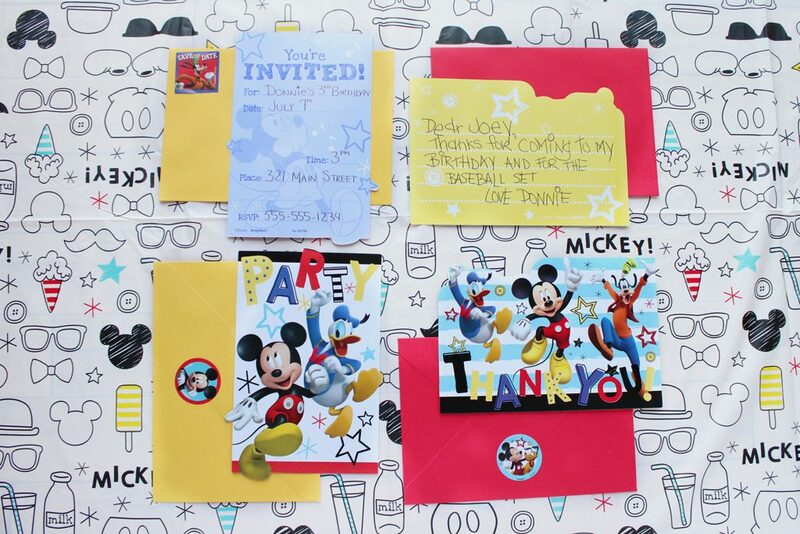 Friends will be ready to grab their ears and get in the Disney spirit once receiving your Mickey Mouse party invitation in the mail. 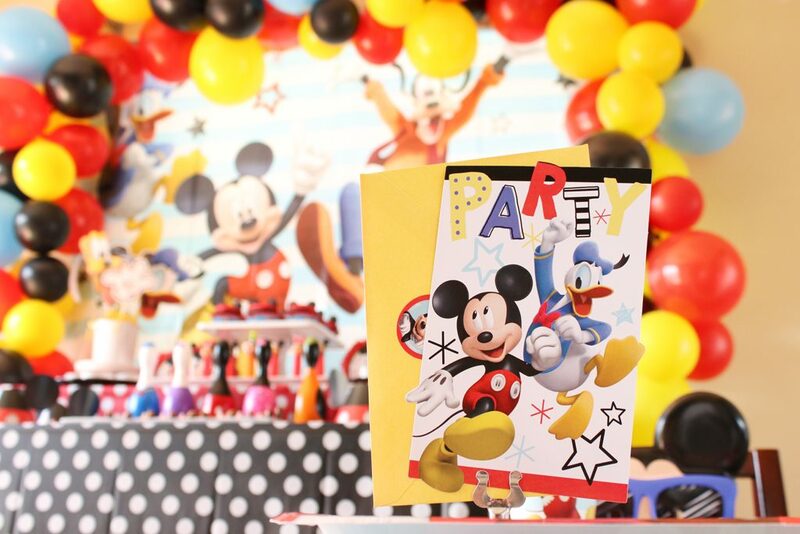 This will be the first glimpse of your party filled a modern red, white, yellow and light blue color palette that’s sure to bring a smile to everyone’s face, no matter their age. 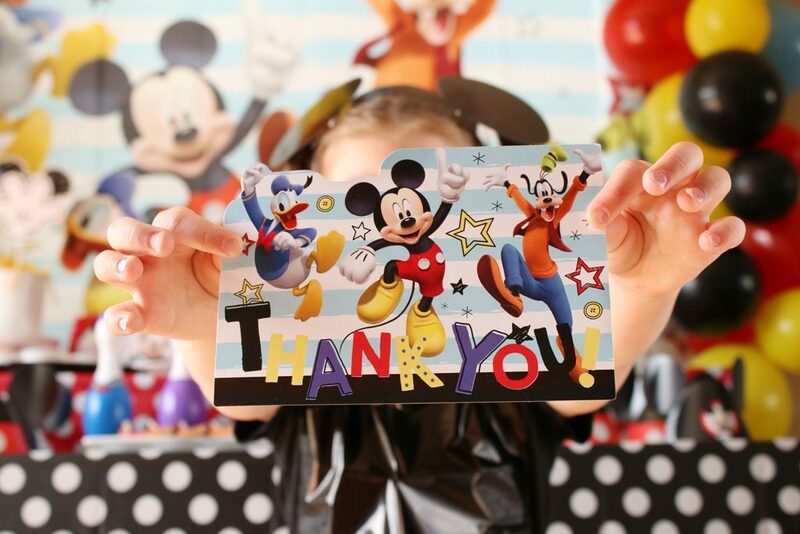 Don’t forget to grab matching Thank You cards you can send later to show your appreciation. 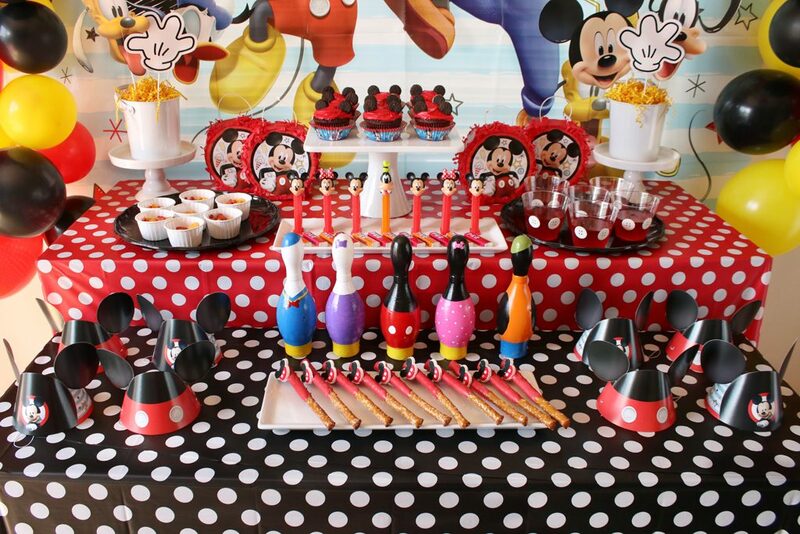 Make your dessert table stand out with a Mickey Mouse Wall setter as the backdrop full of all those friendly Disney characters. 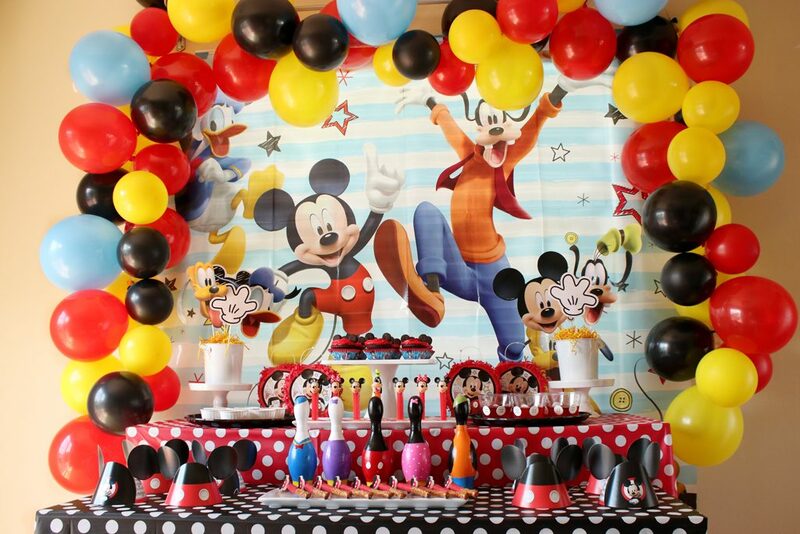 Surround it with your very own DIY balloon arch that’s much easier than you think, thanks to a balloon decorating strip and balloons that require no helium! 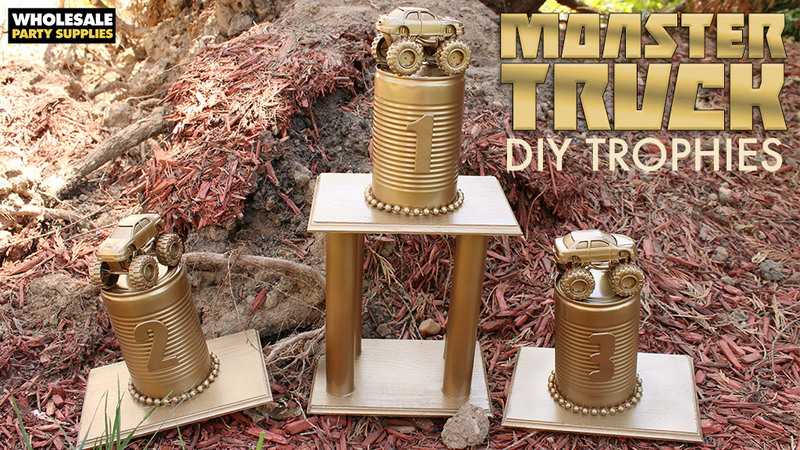 Use the photo props that come with the wall setter kit to create centerpieces. Simply stick them into floral foam in a tin bucket, add paper shred and you’re all set with another cute display piece to use on your dessert table or the center of eating tables. 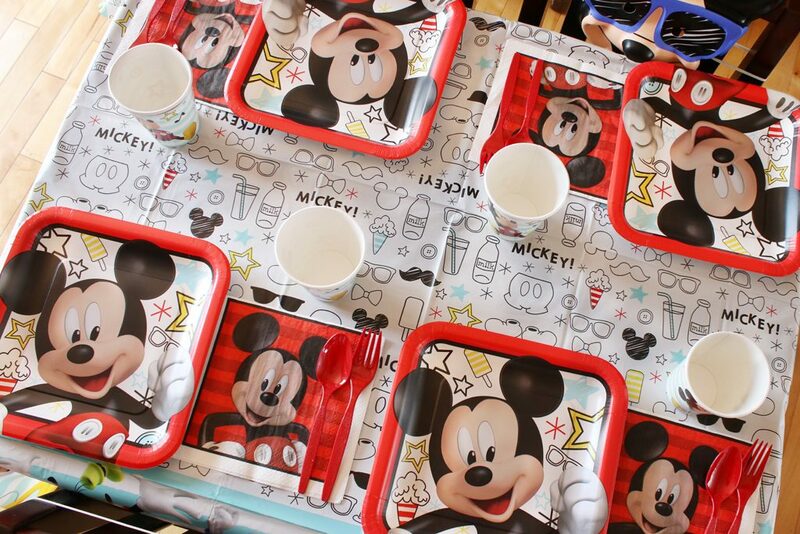 When it’s time to chow down, decorated their food table with a Mickey Mouse tablecloth and matching tableware. Don’t forget the chairs! 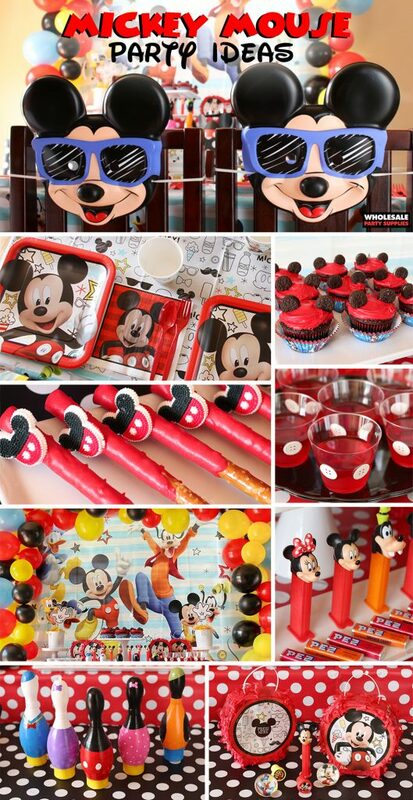 Add a cute Mickey Mouse mask to each one that serves as both a decoration and party favor! 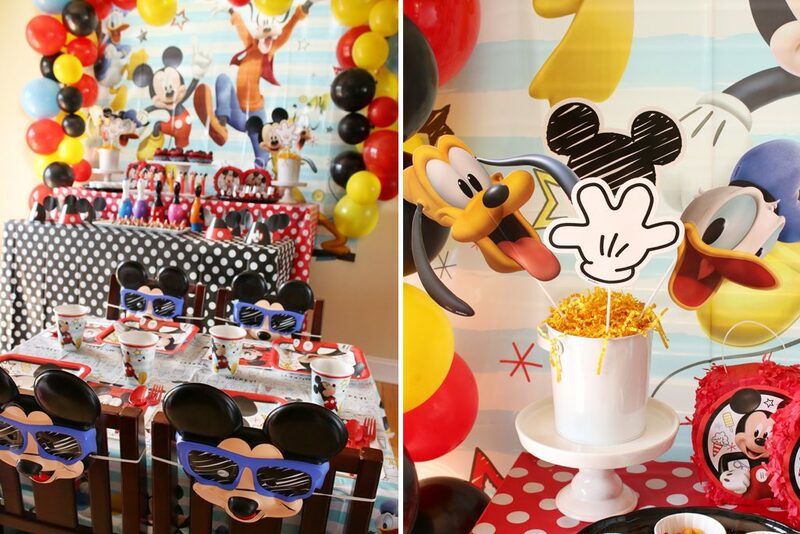 When it comes to your Mickey Mouse party foods, take the Portlandia approach and instead of putting a bird on it, put Mickey ears on it! Literally! 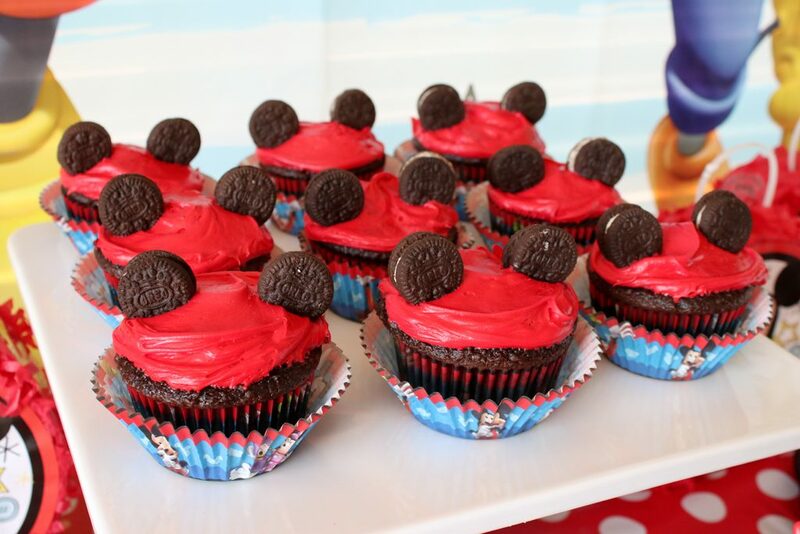 Store bought or homemade cupcakes in Mickey Mouse baking cups instantly turn into Mickey himself with the help of 2 OREO cookies as ears. 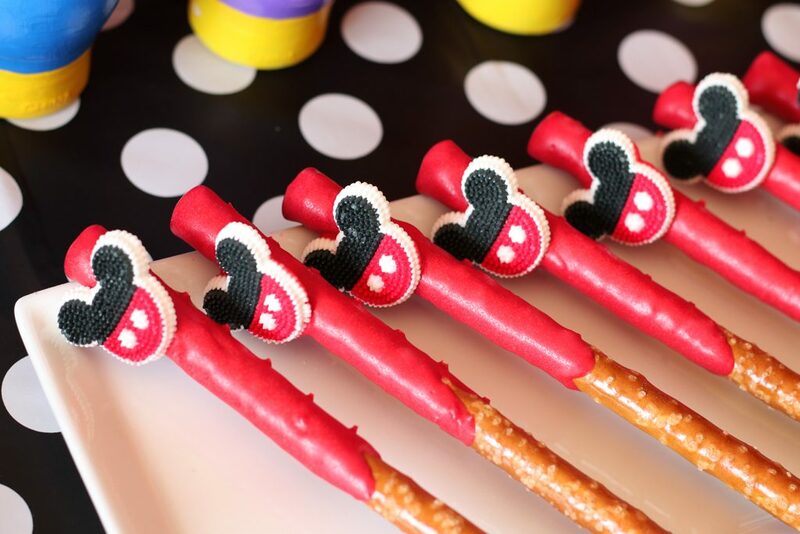 Add a Mickey icing decoration to chocolate covered pretzel rods to really bring the theme home! Jello is ALWAYS a great way to add color to a party dessert table. 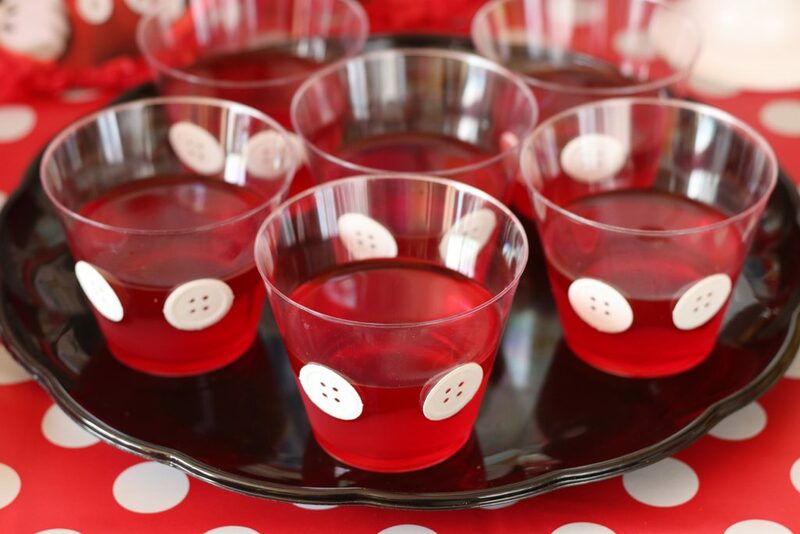 Create these cute Mickey Jello cups with the simple use of circle punch outs on clear containers filled with red jello, much like Mickey’s pants. 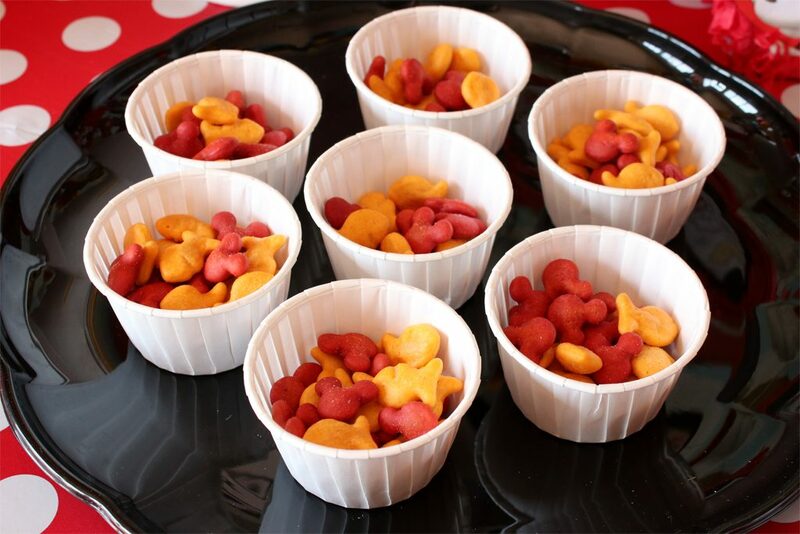 Offer single serve snacks in mini cups filled with a Disney themed trail mix. Tip: scour your snack aisle as your bound to find crackers or pretzels donning Mickey’s favorite head shape. 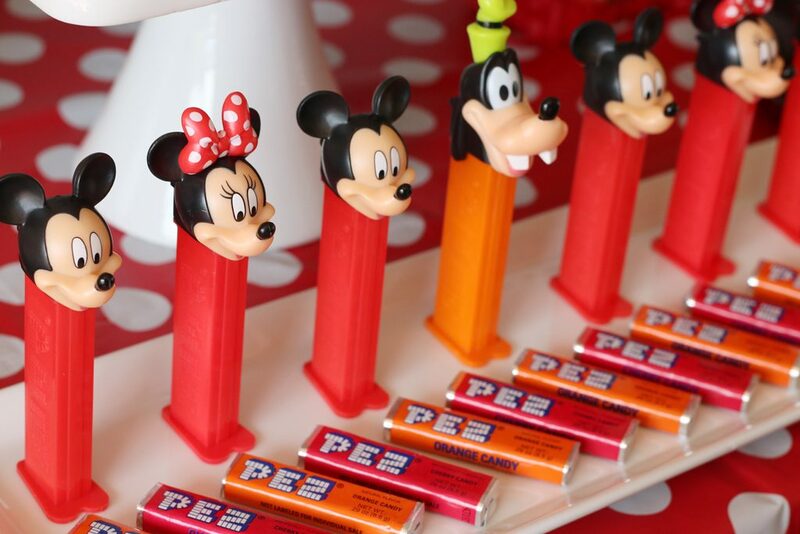 These Disney character Pez dispensers are the perfect complement to your Mickey party display and they make an extra favor for guests to take home! When it comes to kids and sugar-filled birthday party treats, you know one thing, they need to run that sugar off! Break out all the outdoor games, bikes, and toys and get these kids outside! 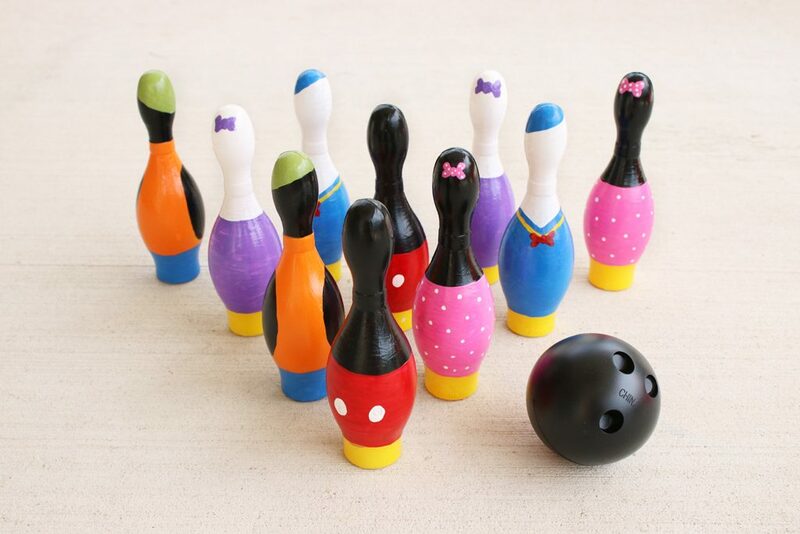 See how to create this fun Disney bowling game with the help of acrylic paint! 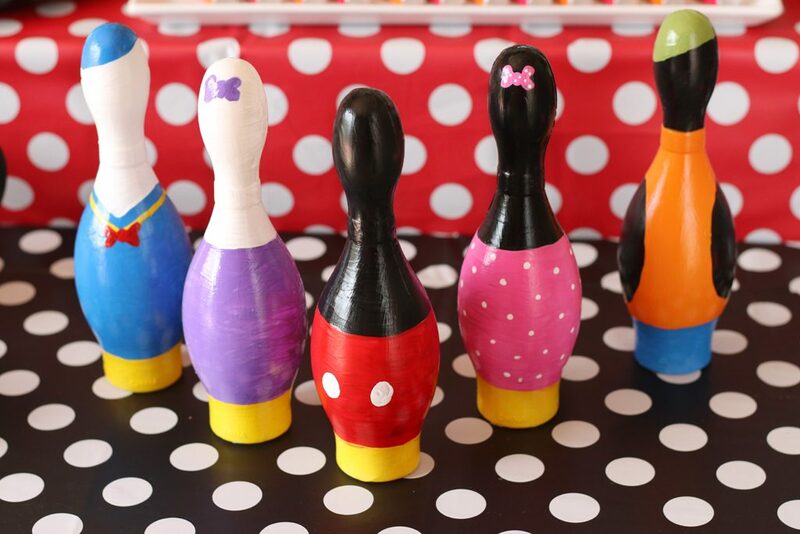 If you’re looking for a cute and affordable photo op station, break out these Disney character costumes that will surely have your crew yelling “HOT DIGGITY DOG” when dressed like Mickey, Donald, Goofy and Pluto! 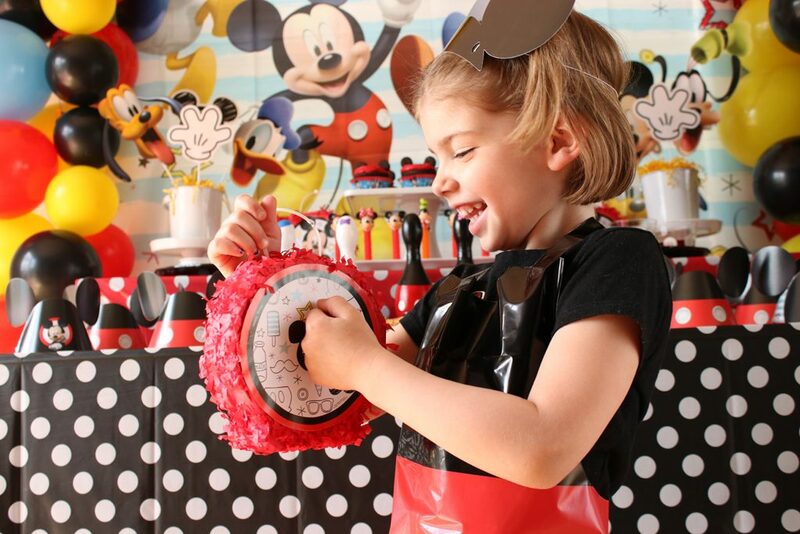 If you don’t have time to create a DIY punch box to fit your Mickey Mouse party theme go the next route of party prize fairness and offer mini Mickey Mouse piñatas to each party guest! 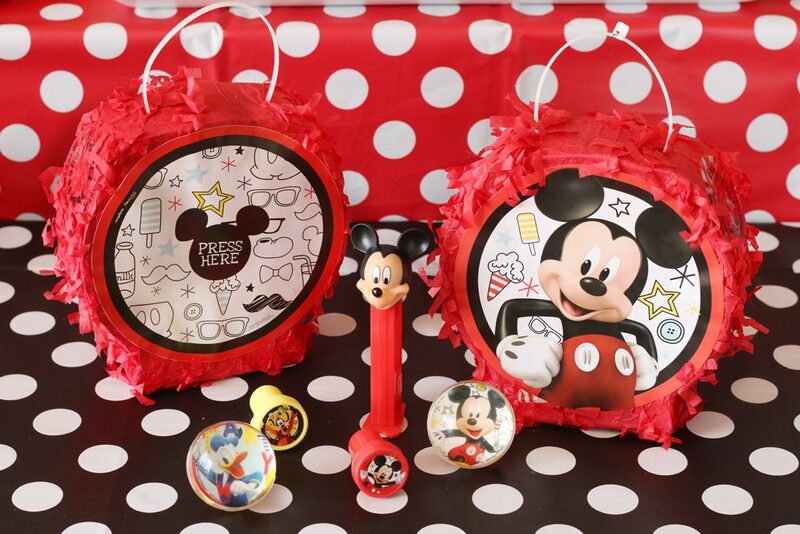 Add your filling of choice, such as the always popular candy assortment, or go the non-sugar route and fill it with fun items like Mickey Mouse bounce balls and stampers! 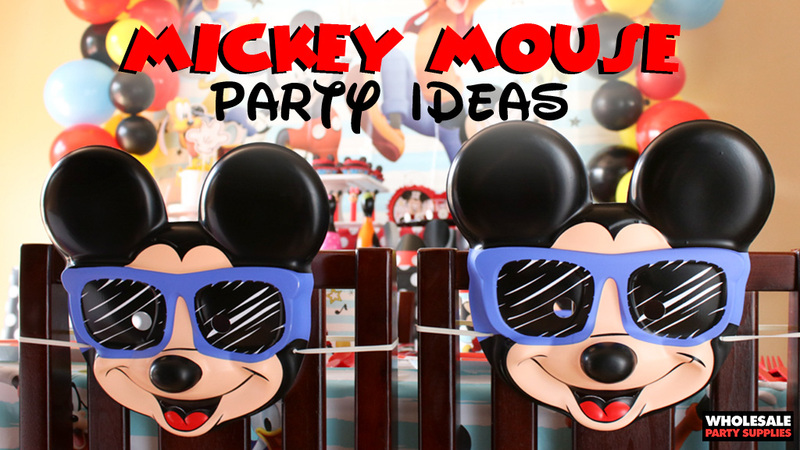 If you are ready to start planning your own Disney themed celebration, WholesalePartySupplies.com has all the Mickey Mouse Party Supplies you’ll need!